Clint Dempsey's late winner gave Fulham victory against 10-man Liverpool in the Premier League and ended the visitors' hopes of a seventh away win in a row. The visitors saw Jay Spearing dismissed after 71 minutes when he won the ball but then clattered into Moussa Dembele. Liverpool were punished in the 85th minute as Dempsey finished after Jose Reina spilled Danny Murphy's strike. Earlier Jordan Henderson and Stewart Downing hit the woodwork for Liverpool, with Dempsey doing the same for Fulham. Exactly half of Fulham's 14 Premier League matches this season have been goalless at half-time, more than any other club. Fulham had failed to win any of their last seven Premier League matches in which the half-time score was goalless. The sending off was crucial to the outcome and was a controversial one as Spearing got the ball. However, he followed through and caught Dembele, meaning that the Liverpool midfielder was always in danger of getting a red card. His dismissal meant that a game that had been even swung in favour of Fulham and Liverpool's resistance was broken when Reina made a bad error, having produced several important saves beforehand. The result meant that Fulham won for only the second time in nine league games at Craven Cottage, moving them up to 13th in the table, and it did little to change Liverpool's reputation as a side that unduly struggles against lesser sides. The visitors were facing up to life without their influential defensive midfielder Lucas Leiva - ruled out with a knee injury for the rest of the season - and Spearing was the man drafted in to replace him. Both goalkeepers were forced into early saves with Reina the first to be called into action as he saved Dembele's side-footed effort before Fulham goalkeeper Mark Schwarzer kept out a 10-yard snapshot from Andy Carroll. Reina was then forced to keep out long-range efforts from Dembele and Dempsey, but Henderson's quick thinking almost gave Liverpool a 28th-minute lead as he cut inside and unleashed a curling strike that struck a post. Luiz Suarez fired wide for the visitors but Fulham finished the first half strongly as Dempsey again tested Reina from distance before firing a shot off target. The momentum swung again after the break as Liverpool piled on the pressure with a Jose Enrique volley from 30 yards being palmed out by Schwarzer. 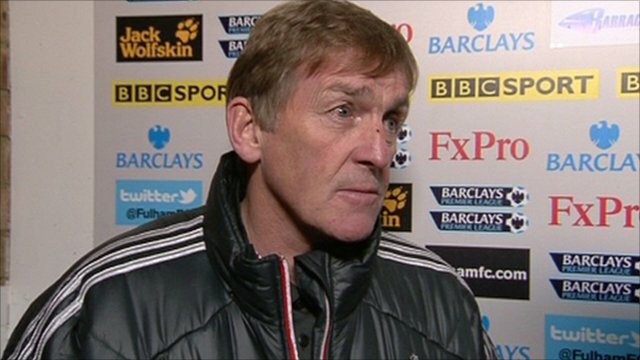 Kenny Dalglish's side had a penalty appeal denied after a brisk counter-attack ended with Charlie Adam being brought down by Philippe Senderos, but the Swiss defender was adjudged to have been outside the box when he pulled back the Scottish international. Liverpool kept pushing hard. Craig Bellamy dragged a shot wide from Glen Johnson's pass and Suarez had a strike ruled out for offside, but the Merseyside club's hopes took a huge blow when Spearing was shown his straight red on 71 minutes, playing the ball first but then making heavy contact with Dembele. Dempsey was inches away from scoring in the 81st minute, hitting the bar after cutting inside in similar fashion to Henderson earlier, and Fulham gained late momentum, with Dembele forcing a save from Reina and also shooting wide. Any points now are big because the table is so tight. For the goal, Danny Murphy got a good shot in. Sometimes you get lucky. After the red card, we had more space and got the goal so we're excited. Liverpool could have snatched a goal themselves as Downing surged forward and forced Schwarzer to push the ball on to the post, but the away side were cruelly sunk with five minutes to go. Murphy beat Glen Johnson on the edge of the 18-yard box and Reina embarrassingly spilled the midfielder's low shot. Dempsey reacted quicker than Daniel Agger and won the game with a simple, close-range finish. Fulham manager Martin Jol: "We dropped points at home against Everton when we were the better team - we were pretty unlucky. Tonight we had the rub of the green. "We weren't the better team but it was even. Mark Schwarzer is one of the best in the business and he saved us. "I think it was a bad tackle [by Jay Spearing]. His ankle was there and I think it was a sending-off." Liverpool manager Kenny Dalglish: "We didn't play as we have been but we did enough to come away with something from the game. "But we didn't and we can't feel sorry for ourselves. Even when we went down to 10 men we kept pressing, and I can't fault that. "Jay Spearing won the ball, but upset the referee with the follow-up. Sometimes it's a red, sometimes it's not." 90:00+5:20 The match has reached full-time. 90:00+4:18 Andrew Johnson has an effort at goal from deep inside the area missing to the right of the goal. 90:00+1:49 Strike on goal comes in from Luis Suarez from the free kick. 90:00+1:49 Substitution Marcel Gecov joins the action as a substitute, replacing Danny Murphy. 90:00+1:49 Philippe Senderos concedes a free kick for a foul on Luis Suarez. 88:49 Sanchez Jose Enrique gives away a free kick for an unfair challenge on Bryan Ruiz. Danny Murphy takes the free kick. 87:51 Shot from outside the box by Charlie Adam misses to the left of the goal. 84:29 Danny Murphy takes a shot. Jose Reina makes a save. 84:17 The assist for the goal came from Danny Murphy. 84:17 GOAL - Clint Dempsey:Fulham 1 - 0 Liverpool Clint Dempsey finds the net with a goal from close range high into the middle of the goal. Fulham 1-0 Liverpool. 83:51 Corner from the left by-line taken by Danny Murphy, save made by Jose Reina. 83:27 Dirk Kuyt takes a shot. Save by Mark Schwarzer. 82:39 Moussa Dembele produces a left-footed shot from the edge of the area and misses to the left of the goal. 82:15 Stewart Downing is flagged offside by the assistant referee. Free kick taken by Mark Schwarzer. 81:51 Free kick awarded for a foul by Brede Hangeland on Luis Suarez. Glen Johnson restarts play with the free kick. 81:17 Clint Dempsey has an effort at goal from just outside the box which goes wide of the right-hand post. 80:56 Moussa Dembele takes a shot. Save by Jose Reina. 79:56 Clint Dempsey takes a shot. 78:44 Corner taken by Stewart Downing from the left by-line. 77:55 Clint Dempsey takes a shot. Blocked by Martin Skrtel. 76:08 Charlie Adam takes the direct free kick. 76:08 Substitution Stewart Downing is brought on as a substitute for Craig Bellamy. 76:08 Substitution Dirk Kuyt joins the action as a substitute, replacing Andy Carroll. 76:08 Andy Carroll fouled by Philippe Senderos, the ref awards a free kick. 75:25 Luis Suarez is flagged offside by the assistant referee. Mark Schwarzer takes the indirect free kick. 74:31 Andrew Johnson is ruled offside. Jose Reina takes the free kick. 71:27 Danny Murphy takes the free kick. 71:27 Sent off Jay Spearing dismissed for serious foul play. 71:23 Jay Spearing concedes a free kick for a foul on Moussa Dembele. 69:55 Free kick taken by Mark Schwarzer. 69:55 Substitution Andrew Johnson comes on in place of Bobby Zamora. 69:55 Brede Hangeland fouled by Luis Suarez, the ref awards a free kick. 68:47 Daniel Agger challenges Dickson Etuhu unfairly and gives away a free kick. Mark Schwarzer takes the direct free kick. 66:41 Luis Suarez takes a shot. Save by Mark Schwarzer. 65:59 The offside flag is raised against Luis Suarez. Mark Schwarzer takes the indirect free kick. 65:34 Bryan Ruiz challenges Charlie Adam unfairly and gives away a free kick. Charlie Adam takes the free kick. 64:52 Andy Carroll has shot on goal from just outside the box which goes wide of the right-hand upright. 64:26 The referee blows for offside against Bobby Zamora. Indirect free kick taken by Jose Reina. 62:43 Effort from inside the area by Craig Bellamy misses to the left of the target. 62:10 Danny Murphy takes a shot. Save by Jose Reina. 61:20 John Arne Riise fouled by Craig Bellamy, the ref awards a free kick. Danny Murphy takes the direct free kick. 60:27 Inswinging corner taken left-footed by Charlie Adam from the right by-line, Headed effort from deep inside the area by Daniel Agger misses to the left of the goal. 58:39 Direct effort from the free kick comes in from Craig Bellamy, Stephen Kelly gets a block in. 58:39 Booking Philippe Senderos shown a yellow card. 58:28 Foul by Philippe Senderos on Charlie Adam, free kick awarded. 58:10 Bobby Zamora takes a shot. Blocked by Daniel Agger. 57:05 Outswinging corner taken by Charlie Adam from the left by-line, clearance made by Dickson Etuhu. 54:35 Handball decision goes against Luis Suarez. Free kick taken by Mark Schwarzer. 53:28 Corner taken by Charlie Adam from the left by-line, Mark Schwarzer makes a save. Correction - 53:00 Martin Skrtel takes a shot. Blocked by Philippe Senderos. 52:44 Corner taken short by Jordan Henderson. 52:16 Martin Skrtel takes a shot. Philippe Senderos gets a block in. Correction - 52:01 Sanchez Jose Enrique takes a shot. Save made by Mark Schwarzer. 52:01 John Arne Riise takes a shot. Save by Jose Reina. 51:44 Inswinging corner taken left-footed by Charlie Adam, Mark Schwarzer makes a save. 51:15 Charlie Adam takes a inswinging corner from the right by-line played to the near post, Stephen Kelly makes a clearance. 50:36 Corner taken left-footed by Charlie Adam. 48:20 Booking Craig Bellamy is cautioned by the ref for unsporting behaviour. 48:00 Booking Clint Dempsey goes into the book. 45:00+1:18 The whistle is blown to end the first half. 45:00+1:01 Clint Dempsey takes a shot. 44:42 Charlie Adam delivers the ball from the free kick left-footed from right channel, clearance made by Philippe Senderos. 44:42 Booking The referee shows Moussa Dembele a yellow card. 44:36 Moussa Dembele gives away a free kick for an unfair challenge on Luis Suarez. 43:59 Bryan Ruiz challenges Daniel Agger unfairly and gives away a free kick. Free kick taken by Jose Reina. 42:02 Clint Dempsey concedes a free kick for a foul on Charlie Adam. Charlie Adam crosses the ball in from the free kick. 39:28 Moussa Dembele takes a shot. Blocked by Martin Skrtel. 38:12 Clint Dempsey produces a right-footed shot from outside the penalty box and misses wide left of the target. 37:49 Charlie Adam concedes a free kick for a foul on Clint Dempsey. Clint Dempsey takes the free kick. 36:39 Clint Dempsey takes a shot. Save by Jose Reina. 33:00 John Arne Riise challenges Glen Johnson unfairly and gives away a free kick. Jose Reina restarts play with the free kick. 32:42 Andy Carroll takes a shot. Brede Hangeland gets a block in. 31:38 Andy Carroll fouled by Danny Murphy, the ref awards a free kick. Direct free kick taken by Jay Spearing. 31:08 Bryan Ruiz takes a shot. Blocked by Sanchez Jose Enrique. 30:05 Effort on goal by Luis Suarez from inside the penalty box misses to the right of the target. 28:52 Clint Dempsey takes a shot. Blocked by Martin Skrtel. 27:18 Effort from inside the penalty area by Jordan Henderson hits the post. 26:37 Corner from the right by-line taken by Charlie Adam, clearance by Brede Hangeland. 25:43 Danny Murphy takes a inswinging corner from the left by-line to the near post, clearance made by Charlie Adam. 25:13 Craig Bellamy challenges Moussa Dembele unfairly and gives away a free kick. Danny Murphy takes the direct free kick. 22:20 Sanchez Jose Enrique concedes a free kick for a foul on Bryan Ruiz. Free kick crossed by Danny Murphy, clearance by Andy Carroll. 18:52 John Arne Riise concedes a free kick for a foul on Craig Bellamy. Charlie Adam crosses the ball in from the free kick, save made by Mark Schwarzer. 18:26 Free kick awarded for an unfair challenge on Andy Carroll by Brede Hangeland. Jay Spearing takes the direct free kick. 18:12 Clint Dempsey takes the chance to get an effort at goal. Jose Reina makes a save. 16:34 Moussa Dembele takes a shot. Save by Jose Reina. 15:08 Effort from outside the box by Luis Suarez goes wide right of the target. Correction - 12:39 Charlie Adam takes a shot. Save made by Mark Schwarzer. 12:39 Charlie Adam takes a shot. Save by Mark Schwarzer. 10:19 Free kick awarded for an unfair challenge on Bryan Ruiz by Jay Spearing. Danny Murphy takes the free kick. 7:12 Andy Carroll takes a shot. Save made by Mark Schwarzer. 6:29 Corner taken by Charlie Adam from the right by-line, Brede Hangeland makes a clearance. 6:04 Effort on goal by Charlie Adam from 20 yards. Stephen Kelly gets a block in. 5:33 Moussa Dembele takes a shot. Save by Jose Reina.